Capsule Summary: Annoyed with the poor fitness of the 4077th, Colonel Potter sets up the first annual M*A*S*H Olympics. I had this episode confused with “Run for the Money” while rewatching it which actually turned out to be a good thing because I didn’t remember exactly how it ended. Would Colonel Potter really get so bent out of shape just because a group of doctors, corpsmen, and a nurse couldn’t tip over an ambulance after two half-hearted attempts? And what happened to the regular morning calisthenics seen in earlier episodes? Maybe once Frank left there was nobody left eager to exercise. Beeson Carroll originated the role of Donald Penobscott in “Margaret’s Marriage” but former Tarzan actor Mike Henry took over in this episode. Unfortunately, Donald is portrayed as a bit of a doofus here, perhaps to better counterbalance Margaret’s crazed enthusiasm for the three extra days of R&R. Donald losing the tie-breaking obstacle course was expected but still really stupid. The minor B Story in which Klinger attempted to eat his way out of the army (“I call it food for freedom!”) worked well because it fit perfectly with the A Story. Most of his stunts and schemes stood no chance of working but this one could have worked if only Klinger had slowly and methodically gained weight rather than trying to pack on the pounds overnight. When Margaret drives off in the jeep with Donald, Hawkeye can be seen for just an instant pushing B.J. in the wheelchair. The episode the cuts to a scene in the O.R. Then the tag starts with a glimpse of Margaret and Donald driving away before focusing on Hawkeye and B.J. It’s a rough edit and suggests to me that the O.R. scene was originally intended as the tag but for some reason the wheelchair scene was substituted instead. This episode takes place at some point between July 19 and August 3rd, 1952. That’s when the Summer Olympics in Helsinki were held. Is this the only time we see dirty trays stacked on a cart in the Mess Tent? Nurse Kellye can be seen at the front of the crowd during calisthenics and is on B.J.’s team for the Olympics but I don’t see any of the other regular background nurses in the episode. Or Igor, for that matter. Goldman is in the Mess Tent when Potter announces the games. Maybe they were hiding. The nurse carry is reminiscent of the gurney race seen in “The Trial of Henry Blake” during Season 3, only not quite as much fun. I doubt it was an easy scene to film and I wonder if some of the spills and falls were accidental rather than scripted. Klinger’s reaction to the lighting of the “Olympic” torch is odd. The flames weren’t out of control and he wasn’t in any danger. This is one of my favorite episodes of the entire series, it had so much going for it in terms of comedy that it’s just absolutely hilarious – not just the spills in the Nurse Carry, but the Crutch Race as well (notice after Mulcahy falls, he just sits there for the rest of the game crying). There’s a key scene from this episode that’s actually cut in most syndicated prints: after Potter announces his incentive, they fade to commercial, so we lose Potter pitting Hawkeye and B.J. against each other as team captains, and their own little side bet about the loser having to push the winner in a wheelchair. Some of the newsreel footage is also cut from syndication, as well as that little scene you mentioned that interrupts Margaret and Donald driving away. I’ll agree that Beeson Carroll was a better Penobscott, but wasn’t Mike Henry also a football player? I suppose they needed someone particularly athletic rather than someone who could act well to pull off the Nurse Race and Obstacle Course in a convincing manner. Charles proves in this episode how unintentionally hilarious he can be: notice when they’re trying to flip the ambulance back on its wheels, he doesn’t even try – he’s more concerned about his hands. In case no one knows, Mike Henry,in addition to playing Tarzan, also played in the NFL with the Pittsburgh Steelers and the L.A. Rams. He also was in “The Longest Yard” and the first “Smokey and the Bandit” movie. I wonder how Radar would’ve fared if he competed in the Olympics. Also, I found Margaret’s pep talk to be excessively over the top. This seems to be a decent episode if you like athletic lunacy. In closing, I take issue with Col. Potter obviously favoring Donald in the obstacle course against Sgt. Ames. Mike got to show off his military training skills doing the somersault after being tripped by Hawkeye. This is a solid episode from a pretty spectacular season. Very silly episode – one of the worse – in a disappointing season. Thankfully the show picked up again in season 7. We may be in the minority, but I also do not like this episode. Especially the scene where Potter agrees with Hawkeye’s objection to Penobscot participating in the event, then Hawkeye stupidly succumbs to Penobscot’s taunting and changes his mind. Completely out of character for someone so cynical. Anyone know who the blonde nurse is that Hawkeye carries during the Nurse Carry? She’s wearing a pink top and has pig tails, and is seen multiple times throughout the episode. They made a mistake in wardrobe during the MASH OLYMPICS. Major O’houlihan (Loretta Swit) was wearing shiny pantyhose with her shorts. Pantyhose were not invented yet. I have read that Loretta Swit insisted on ALWAYS being photographed in pantyhose. In this particular episode, it is obvious. But if you look closely in other episodes, her legs were never completely bare. I like Father Mulcahy’s line about being near the cross as they try to turn the ambulance over,sounded dubbed in. 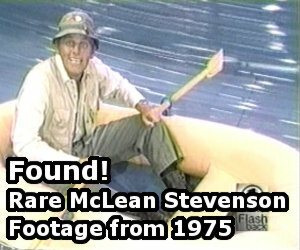 Wonder what was blacked out with a bar on the title screen of one of the Olympic footage newsreels. 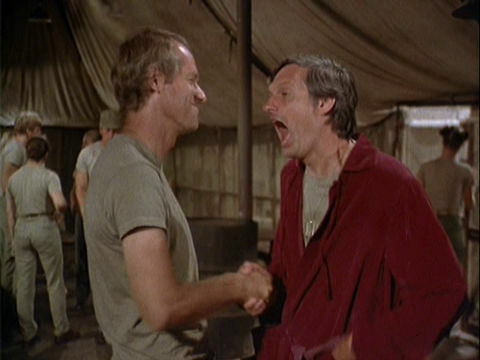 I think I noticed something – In the mess tent, when Klinger offers Ames the untouched pot of Chipped Beef, when it’s refused, and Klinger spoons out a helping of the `Rich, gray slop’, it actually looks more like Tuna Salad than Chipped Beef. At least this episode explains one MASH mystery….apparently the MPs hold court in Roseies until someone runs across the street to tell them a truck flipped over or they’re needed for some other reason. I like this episode! Klinger running with the torch cracks me up every time. Also I like the black and white footage. It adds a nice comparison.